It works a lot like a public transportation system. There are daily, weekly, and monthly cards. You can get a card right at the kiosk. Then you enter in your card number and then pick what number bike you want. When you pull the bike out of the rack, it’s yours. Here’s Emily taking a bike out this morning. When you are at your desination, you just put the bike back in the rack and it locks itself. That’s it. Totally self serve. 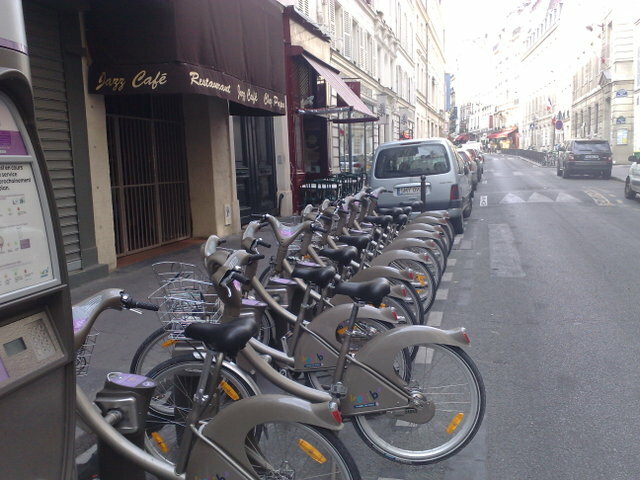 The bikes are super sturdy, have a built in lock/key system so you can lock it up somewhere ohter than a Velib rack, and a seat that moves up and down. They’ve got three gears, a bell to ring when you need to alert someone to your presence, and a basket for carrying around purses and groceries. It’s the perfect urban bike. 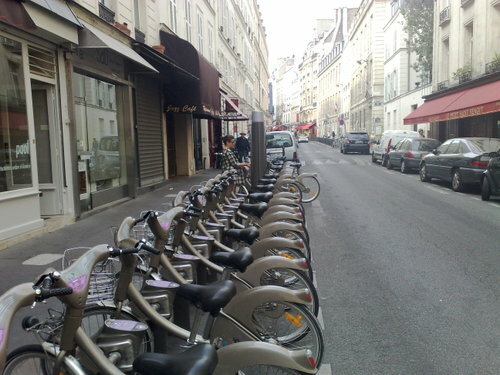 We went for an early morning bike ride along the Seine and then rode back from the Pompidou Center this afternoon. I always thought the Metro was the best way to get around Paris, but I think the Velib might just be even better. Newer post Zakaria Quote Of The Day Older post Are You A Connector?